Switzerland-based VR company, MindMaze received a major investment from Hinduja Group, who has valued the company at over $1 billion. This is a ten-fold increase since its previous valuation in 2012 where it was pegged at $10 million. In a recent report published by the Economic Times, the investment is only “less than a third” of the company and makes MindMaze one of two “unicorns” in the AR and VR industry. MindMaze now joins Magic Leap in this category, which was values at over $4 billion. MindMaze is led by Dr. Tej Tadi—a doctor who specializes in neuroscience—who is focusing combining virtual reality and motion capture with brain machine interfacing in order to help patients recover form traumatic events. What makes MindMaze’s VR system exceptional is how it uses a combination of methodologies to produce interactions in VR with “zero latency.” It combines a band with dry electrodes to sense brainwaves and muscle activity, supported by a motion capture camera that can essentially predict movement before it is made. What happens is the brain is contralaterally mapped, so the right part of the brain controls the left, and the left hemisphere does the right. Now she has a right stroke, she can move the left, but when she’s moving the right hand, and she’s seeing something there, the brain area that’s responsible is saying, hey, hang on, I can still control that hand, let me start kicking some aiders in. And so slowly the recovery comes in. So it’s a game to play—which is fun and entertaining, because [her recovery] isn’t going to happen if she just does it once. She’s got to do it repeatedly to reinforce it, and there the gameification pieces kicked in. The gameification of the process led the way for the organization to consider broader consumer options for the technology. Currently, the team is looking how their technology can be integrated with future generations of VR headsets such as the Oculus Rift or creating a standalone HMD that could compete with what’s currently available in the market today. 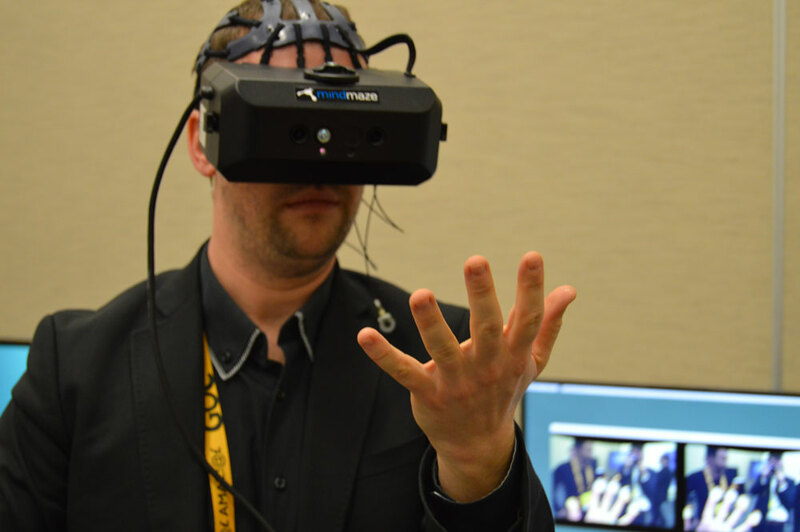 It’s not likely that we will be seeing this technology out in the market in the near future, but it does highlight how VR technology can be fused with brain machine interfacing for various applications.